No. I’m afraid it’s far worse than that, at least from an aspiring writer’s perspective. My adorable black and white ball of fluff, Baron Edgar A. Von Purrtrap, has chewed through my MacBook charger(!!!) the day before my writing partner K.F. Goodacre and I head off to Camp NaNoWriMo for 31 days of dedicated creativity. My computer is refusing to charge, and I will now be forced to fork out a maximum of £65 for a replacement. Fortunately, I’m a bit of an old-school writer who makes more progress with a pen and paper than on a word processor. That being said, typing up what I’ve written at the end of the day is a big thing for me, plus I am now cut off from my Scrivener project that holds a lot of my research and inspiration. If anything it’ll be interesting to see what sort of things I produce without this particular crutch, and I suppose it’ll be a lot harder to get distracted by the Internet. There’s a fine line between distraction and concentration, and the chances are that your cat is sitting on it. We are now officially over halfway through NaNoWriMo 2015 and I am sorry to report that I have been a very bad NaNoWriMo participant indeed. I have hardly written anything, and I say this without exaggeration or irony because I have only written a rather non-spectacular 4,929 words. Whilst they are very good words (I really am genuinely very very pleased with them) it’s an inescapable fact that I’m running alarmingly behind schedule if I am to have any hope of reaching 50,000 words by the end of the month. To do so, I would need to write at least 3,219 words per day, which realistically is not going to happen. Thing is though, I always knew I was going to ‘lose’ NaNoWriMo, and I never actually set out to ‘win’ it. I just wanted to use it as an exercise to get back into the habit of writing on a regular basis. Being the despairing owner of a 170,000 word-draft of pure unfinished ramble (my original draft of The Mayor shamefully amounts to only a 1/4 of the whole book), I’m not exactly the firmest believer in ‘quantity over quality’. I’m a very slow writer even at the best and most creative of times. 1) I don’t actually need long, extended periods of uninterrupted writing time sat behind my desk. All the words I’ve written for NaNoWriMo so far have been written on my morning train journey and in the kitchen on my lunch break. Given half an hour or so, I can churn out about 300 words. So if I wrote every day for a week, that’d be approximately 2100 words. If I wrote every day for a month, that’d be approximately 8400 words. If I wrote every day for a year, that’d be approximately 100,800 words i.e. at least one book’s worth. My train journey takes about 30 minutes, each way, so voila. I seem to have found some writing time. 2) The 170,000 words I originally wrote of The Mayor and have been tempted to burn many times aren’t actually that bad, just long-winded. In fact, they’re pretty good, and it’d do me well to perhaps spend some time hammering these into submission and rewriting great chunks of it rather than starting completely afresh as I originally intended. Don’t kill your darlings… recycle them! 3) Writing should be fun. I do find writing fun, most of the time. But NaNoWriMo’s word counts make it feel like a chore. 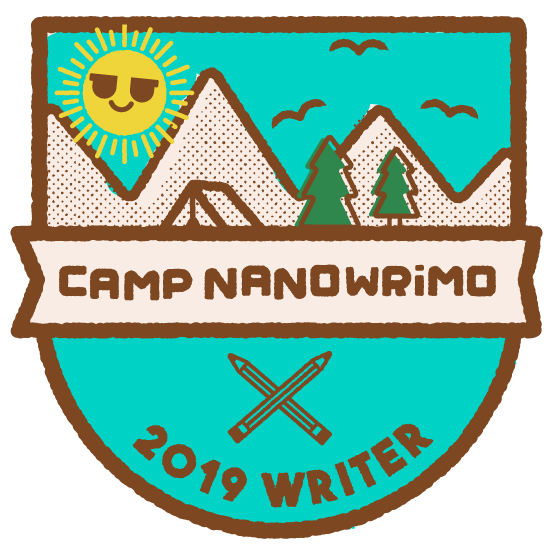 It doesn’t work for everyone, and I think after several attempts now both at regular NaNoWriMo and also Camp NaNoWriMo, it’s time for me to accept that this sort of thing just isn’t for me and to not to feel guilty about it. Crippling levels of guilt and feelings of failure just stop me from writing anything at all. How is NaNoWriMo going for you? Are you doing any better or trailing behind like I am? Think you’ve got what it takes to pen 50,000 words in 30 days? Check out NaNoWriMo’s official websites below. Good luck!